It is the year 2017 of Roger Federer, and He is about to play in the Wimbledon final for the 11th time, and He has yet to drop a set. The seven-time champ cut down Tomas Berdych, 7-6(4), 7-6(4), 6-4 to earn that spot, and, along the way, distilled his genius into two tidy vials. If you want to know why grown adults empty their bowels while watching this man play a ball game on a lawn, and you don’t feel like wading through our tedious archive of stanning or skimming that DFW banger you’ve been fed a thousand times (you should anyway), just watch these self-contained gems, each of which played out in real time. Above all else Federer is known for his forehand, a shot he strikes well out in front of his body while gazing hard at the yellow from behind his racket strings. None of your loved ones have ever looked at you with the intensity or care that Federer displays on a routine forehand. Probably you did not expect to have this sinking feeling when you opened this blog post but I promise you that it is true. It’s the single best stroke in the history of the sport, the skeleton key to all the various puzzles its wielder faces. The Federer forehand can do whatever he asks it to do, with pace, spin, and accuracy. Today, in the second-set tiebreak, he asked a lot of it, and on four straight points, it delivered: cleanly crack return winner (listen to that sound); tight angle nestling itself comfortably within the sideline; calm, deep passing shot; inside-out thunderbolt. That’s 107 mph out wide; 116 down the T; 120 and gettable but just a little too spicy; 119 back down the T again. 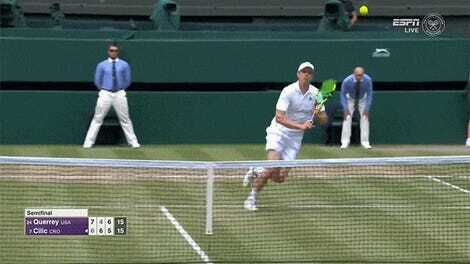 Berdych put a racket on just one of them. 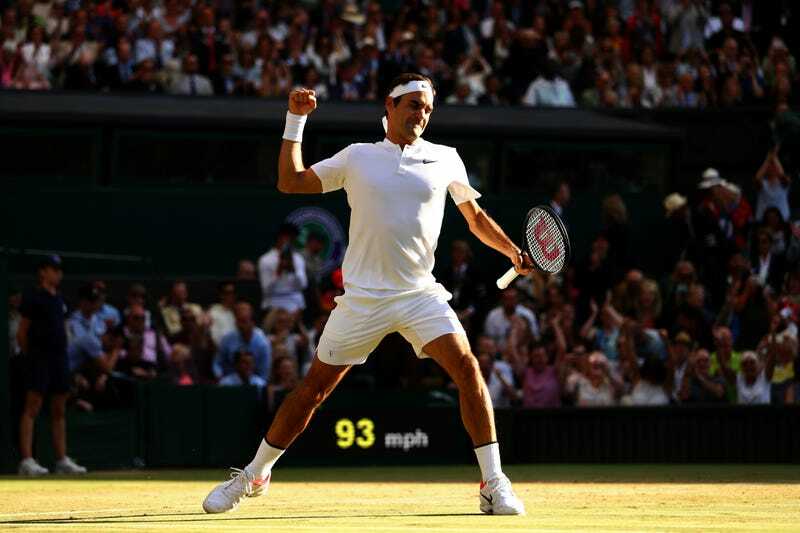 Federer did all this flippantly, as simple as swiping a clod of Wimbledon turf off his shorts. As John McEnroe and the rest of the commentators quipped, this is just him venting frustration. These are Federer at his best. But he is not always at his best. One of the most common swooning refrains has to do with the way his feet move, the way his sneakers automatically, optimally flutter around the court to accommodate the ball, as if welcoming a favorite houseguest. You can see those feet in action in every point. It’s everywhere, the backdrop to all the other ingenuity. What you do need to see is what he’s capable of even when he’s not moving his feet at all—what he did today when caught flat-footed and lunging. What you should know, basically, is that Roger Federer’s desperation looks a little better than the other people’s very best.